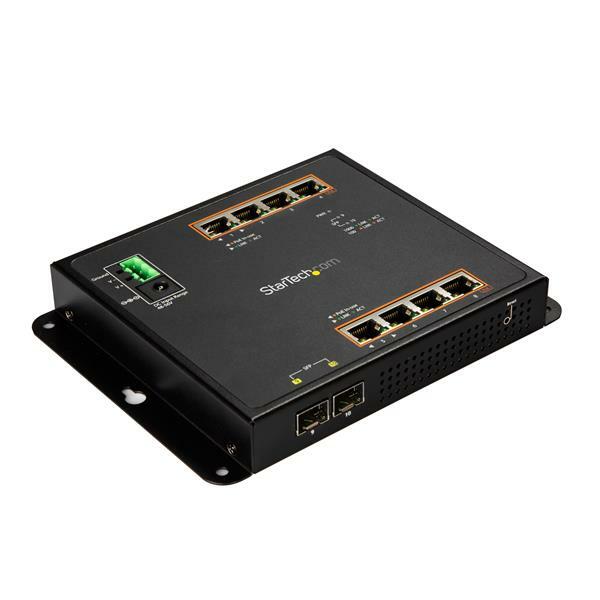 Easily deploy or scale your network with this Gigabit Ethernet switch, by adding eight copper Gigabit Ethernet ports (PoE+) and two fiber-optic SFP slots. This IP30 industrial network switch provides intelligent Layer 2 management. Its rugged, compact design and wall-mount option with front access make it ideal for demanding applications, even where space is limited. 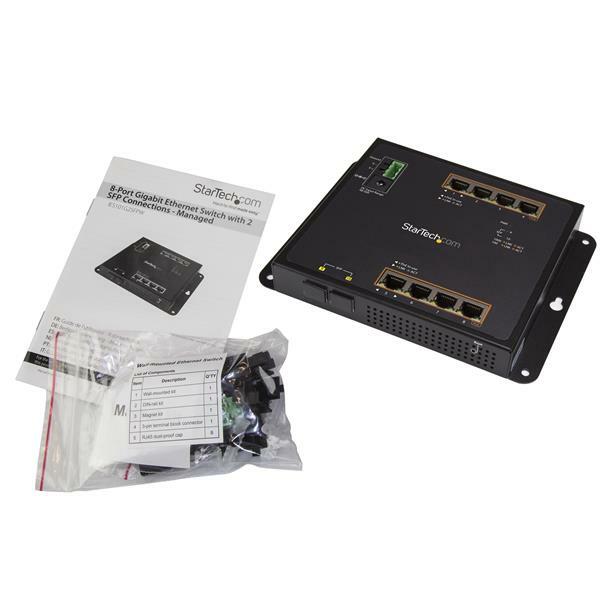 This versatile switch adapts to your network needs by providing two open SFP slots and eight RJ45 Ethernet ports (PoE+), providing both fiber and copper connections in a single network device. The MSA compliant SFP ports are compatible with 100/1000Mbps networks. 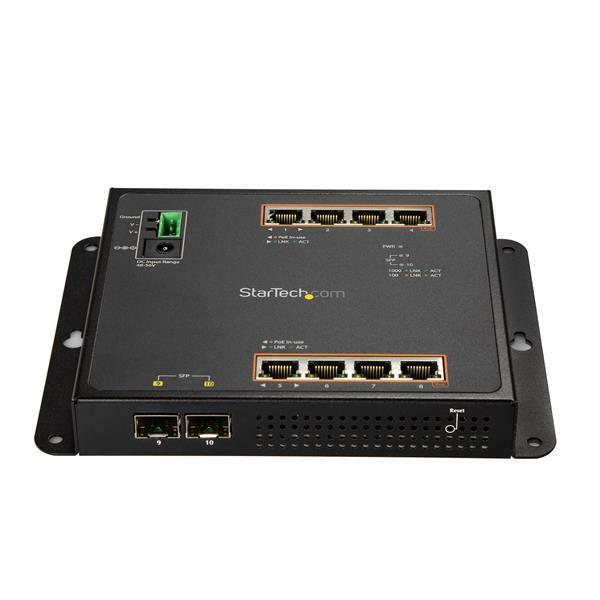 The network switch enables you to connect up to eight RJ45 PoE+ devices, so different users can share files and devices, such as printers and scanners, over a LAN connection. Dual power input (terminal block and DC plug) provides flexible power options. The switch gives you the freedom to place your equipment in locations where power outlets are not available, with support for Power over Ethernet Plus. 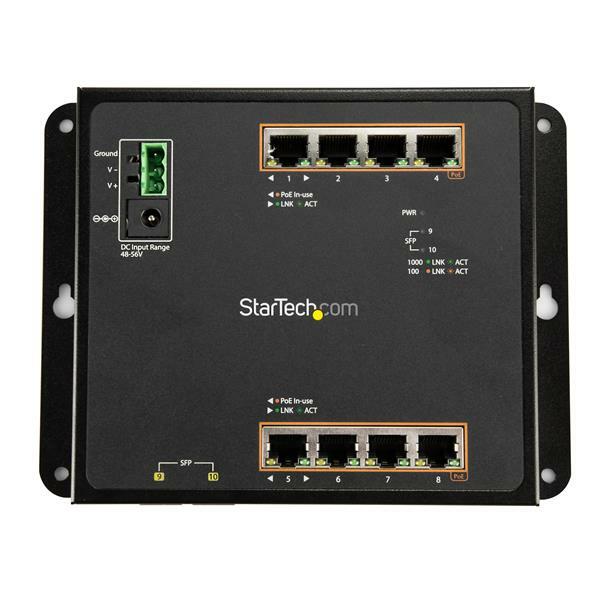 The network switch provides abundant PoE power, with up to 30 watts for each PoE port (200W budget). Wall-mount the compact Gigabit switch to provide convenient front access to ports and indicators. It’s ideal for a wide range of applications, including tight installation areas with significant electromagnetic interference, such as control cabinets and panels. The network switch is also DIN-rail mountable. The IES101GP2SFW is backed by a StarTech.com 2-year warranty and free lifetime technical support. We bought this switch for one of our Customers. When we went to install, we noticed that there was no power supply included. We called Startech who informed us that we would have to get a power supply from a 3rd party and did not have any specific recommendations. This ended up delaying our project and we ended up getting a different network switch that included a power supply. For 20+ years purchasing network switches, I have never come across a product that did not ship with a power supply. To this date we still have no power supply for this switch and it is basically just sitting on the shelf. Thanks for sharing your feedback with us. We sincerely apologize for the confusion surrounding how to power this network switch. This model is designed for industrial settings with terminal block power available. As a result, we do not include a power adapter with the product. It can also be powered by a 48V DC power adapter that supplies 1 to 5A of current. This type of power adapter can be purchased online or from many electronics stores. We hope this helps.